I have been a fan of Diana Wynne Jones for such a long time, I cannot even remember when I picked up my first book by her (though I can remember that book was The Year of the Griffin). So when I saw a commercial years ago for Miyazaki's version of Howl's Moving Castle I almost fainted, as I was obsessed with him at the time, the same time I considered Wynne my ultimate favourite author. Of course at the time I hadn't actually gotten to reading Howl's Moving Castle (Wynne has written a lot of books), but because of the movie, the idea of reading it got planted in my head. When I eventually first read the book I was blown away by just how good it was, just how much better it was than the movie (although I love that as well), to the point where the magic of the movie just doesn't hit me, because the book has it amplified. So when I had a chance to actually purchase a copy of the book, I jumped. I began to reread this book this time around because none of the books I had on hand were good before bed. To begin with I love Wynne's prose style, it is the epitome of comfort read for me, and a joy to read out loud to others. Sophie as a character is very sensible, in fact she's too sensible, so sensible it gets her into trouble, because she lets herself get trapped into situations that she could easily get out of. She is the eldest sister so all lore tells her she shall make nothing of herself is she tries to make for her fortune, but then she is forced to do just that when the Witch of the West comes around for some reason and curses Sophie with an old woman's body. As soon as she leaves she ends up with the wicked Howl and that's where things of course get good. Being an old woman gives Sophie a burst of confidence to show her true personality (instead of just being sensible) and she bullies her way into the hearts of the characters who live with Howl. These characters are also a joy. Having read the Chrestomanci books now, Howl reminds me a lot of flamboyant Christopher Chant, and the connection between worlds also seems like an echo of that idea. The plot is also so layered and complicated, yet is told so simply that it boggles my mind and is a show to Wynne's genius. One of the things that I love the most is that we are only for the ride of the book with Sophie, who thinks she has to take care of everything herself, so we do as well and as she doesn't expect the rest of the characters to know anything, neither do we, so in the end where it's revealed that Howl has known Sophie was not really an old woman, as a reader I was just as flabbergasted as poor Sophie. I also think that it made the attraction that develops between Sophie and Howl very natural as it has all to do with personalities and very little to do with looks. We are also just as tricked as Sophie is by Ms. Angorian and the Witch of the Waste. I do think a lot of the more layered and interesting parts of this book are lost in the movie, such as the Wales layer, and that's what I love most about this book. I loved it (and reviewed it too)! Have you read the second two books set in this universe? 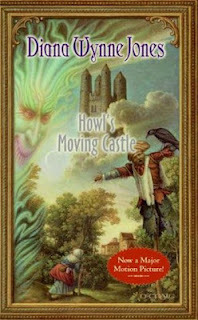 Worth reading, but I don't think they are as good as Howl's.